In the current decentralised application development landscape we see slowly unfolding, it’s very easy to disregard the end user, they are after all faceless anybodies to some extent. If a marketer were to try segment out persons that are most likely to be interested in a new decentralised social media application for example they would quickly realise that the app being decentralized does not really mean much to many. There’s two ways to approach that problem, one way is scaring people away from the established networks by highlighting the naughty behaviours of those mega corporations monetising our data, which is already being done to some extent right now thanks to quality investigative journalism and new regulatory tools such as GDPR. Another way is to paint a picture of how things could be. I recently asked a friend why she thought that even though we have known about Facebook and other platforms privacy violations for some time, why were the majority of people not leaving these services on mass? She responded by saying it’s like the problem of global warming, people feel like they’ve lost control of their environment, but they don’t fully understand what or how to get control back, the problem is perceived too complex, to big to even think about. By the end of this article you should understand why decentralized application are relevant, how decentralized application deliver end user value and how to join your first decentralized application. For those of you unfamiliar with the term a decentralized application (dapp, Dapp, dApp or DApp) is a computer application that runs on a distributed computing system. DApps have been mostly popularized by distributed ledger technologies (DLT), namely the Ethereum Blockchain, where dApps are often referred to as smart contracts. While it’s not the freshest of fresh news that platforms such as Facebook are finally being knocked down a few pegs due to their abhorrent and sometimes downright criminal use of user data, for the purpose of context and as the title of this article suggests, we as regular folk should now have the almost perfect opportunity (with Facebook in the limelight) to look a little closer at the “what if” of Facebook as a decentralised application. As i recently attempted (with some success) to explain to some close friends exactly what a decentralised social app can deliver, from their response i became inspired to write this article in an attempt to further explain where the potential value for end users lie therein. Facebook serves as a good vehicle for explaining the potential value a decentralized app can deliver to the end user, these days most likely your mum, auntie or better half. And so when i sat with friends recently this is how i attempted to explain what a decentralised Facebook could look like, and to some extent why they might prefer using it over the current centralised version. I started with some juicy eye watering numbers. Worldwide, 1.47 billion people log in daily, with 2.32 billion monthly active users (MAU) as of December 31, 2018 and you are all very likely one of them. Facebook had reported global revenue of 40.7 billion US dollars in 2017, that year, Facebook accumulated a net income of 15.9 billion US dollars. As many of us know to some degree the basic business model of Facebook by now, we can easily understand how Facebook turns the activities of this enormous user base of 2.32 billion into an even larger pile of money 15.9 billion – Advertising. Facebook, being a centralised organisation distributes these piles of cash to those persons in the Facebook gang, i.e those who invested early eventually followed by those that purchased shares when Facebook IPO’d May 18, 2012. So as with any centralized corporation a select few people are the only beneficiaries of these enormous profits derived from the online activities of the 2.32 billion users. Oh! And sometimes the tax man also. So if we have on one side 2.32 billion users all tapping away on their little mobile keyboards, sharing, liking commenting etc so that advertising algorithms can easily find them, and on the other side we have a growing mountain of cash – 15.9 billion in 2017. In the middle sits a small group of persons that own Facebook stock, these are the people that say what stays and what goes, and who stays and who goes. This small group together make all the decisions and derive all the profit from all activities on the Facebook platform and its other associated services. 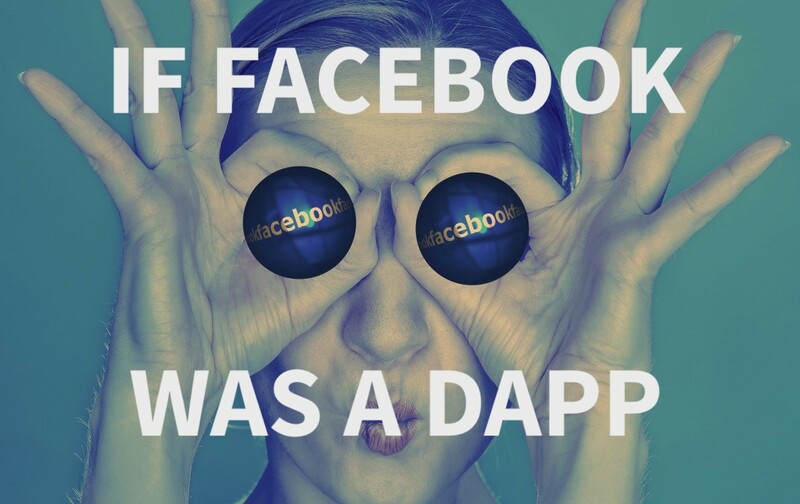 So what if Facebook were decentralised? Keeping with the same numbers, 2.32 billion monthly active users and 15.9 billion in profit, lets for a moment remove the small group of Facebook owners that sit in the middle, and replace them with some simple code. The job of the code? – to provide the 2.32 billion users with a simple way to engage in voluntary decision making on the platform itself; ‘what stays, who goes etc’ and to collect dividends; a share in the profits generated by the platform. This is essentially the basic pitch that many social network users will be bombarded with in the coming months and years, and on the surface it’s a rather good one. The distribution of wealth towards those that create the value in any system is not a new idea, and is already in action via open trade union negotiations in many countries around the world, Germany and Sweden are somewhat pioneering in this field if you believe the socialist hype, it’s the major online international companies that seem to be out of reach to some degree, ungovernable is a word often thrown around when it comes to international tech giants. Once the basic principles of decentralized apps are digested it comes down to your personal position (much like with buying organic food) on what types of digital products you wish to support, and much like the fair trade movement and growing interest in organic produce, i think we are seeing similar movements now growing up in the digital space. With the current conversation being red hot right now around data privacy and giant targets like Facebook being investigated by numerous governments around the world, is the social media landscape ripe for a revolution? Probably not. Much like the development of the fair trade movement, the move towards decentralized apps will likely start with small dedicated groups, likely the early adopters will begin to associate with various digital rights advocacy groups such as Access Now or Open Rights Group. The conversation at least has already started with the launch of GDPR in 2018 which has seen a suite of civil suits opened aimed and pointed squarely at Facebook and similar american megacorporations. My thoughts are that decentralised applications will get most traction initially amongst those that already actually care about digital rights. With so much mainstream reporting on the topic, it is no longer enough to plead ignorance to the privacy and security abuses of the social media services literally billions of us use on a daily basis. The fear of the unknown can prevent many from adopting new technologies, blockchain arguably – like the internet itself – sparked many a fearful headline over recent years, but unlike the internet, blockchain has many of its key attributes readily comprehensible due to both its coming out party as a digital currency – bitcoin, and the fact that the majority of the services its slated to disrupt are already digitised. The fear then, (that needs to be addressed) is the fear of the new and unknown potential of the blockchain as a vehicle for generating new economic models, and how to communicate those key aspects in a friendly way. Many will, and have embraced some of these new decentralised application services, with the top three social network dapps in action today attracting thousands of users each. Much like the promise of the early open internet, which eventually was gobbled up by the likes of mega corporations such as Google and Facebook, blockchain, and so decentralised applications are set to take us back to square one when it comes to building and open and transparent internet, the bigger question of course being how many want such an internet? and will there be enough of us to make any kind of impact? While many people not familiar with blockchain terminology will shiver at the thought of managing their own private keys on a blockchain, many millions of people already do, and as much as the discussion around the key to user adoption being the simplifying of the user experience through design, if you as a user have not generated and are not in full control of you private keys then it means someone else is. It is this key vital piece of information that any new users to the space should understand above all else, before interacting with any dapps or any blockchains understand the function and importance of your private keys. Once you have a grasp on what it means to own private keys you will be ready to join a dapp, luckily both the Steem and EOS platforms presented in the following segment have made efforts to simplify the onboarding process. As of March 3rd 2019 a quick look at the website stateofthedapps.com, sorted by users over a 24h period, you will see that three of the top five social dapps are on the Steem platform, the other two are on EOS. For the uninitiated Steem has been operating in the space since 2016 and is easily one of the first, if not the first social blockchain that claims to grow communities and makes immediate revenue streams possible for users by rewarding them for sharing content. Steemit Inc is the mother company and creator of the Steem blockchain Graphene. EOS is a much more general blockchain platform and was developed by the private company block.one and released as open-source software in 2018, The aim of the platform is to provide decentralized application hosting, smart contract capability and decentralized storage of enterprise solutions that solve the scalability issues of blockchains like Bitcoin and Ethereum, as well as eliminating all fees for users. As there are already plenty of review materials online for these two platforms feel free to do your own homework, here i want to focus on the onboarding user experience, something that until recently was somewhat of a challenge. The two mobile social dapps i have been using are for the Apple iOS device, MurMur on EOS and Partiko on Steem, both dapps are also available on the Google play store. So, if you as a reader were somewhat inspired so far by reading this article, you can now take action and try a social network dapp yourself. Getting started with social network MurMur on EOS has been made super easy by the people at MurMur, they’ve taken a lot of the work out of the onboarding to the EOS blockchain by offering to pay for the creation of an EOS account to new users, an action for which you would usually need to hold EOS which most people do not. I am unsure how long this free EOS account offer will last so by the time you read this the terms may have changed, If that’s the case head here to learn how to set up an EOS account first. Get started with Murmur – https://murmurdapp.com using “bit511bit511” as referral code if you like. Your account will be activated by us between 24-72 hours. MurMur will pay for creating the account and stake some EOS towards RAM (one time only). If you exhaust this, you will have to stake more EOS for publishing on Murmur. So it helps to be mindful about what you publish and share on Murmur. If you do find that you need more EOS you can acquire them from any of the exchanges listed here and simply move them off the exchange onto your personal EOS account. Once you are in and rocking a rolling i recommend having a sniff around, try things, follow people, you will quickly discover how the MurMur dapp mimics popular social networks like Facebook. Partiko is a child service of the larger Steem blockchain ecosystem which included numerous dapps including the decentralized answer to YouTube – Dtube, once you have a steem account you can easily access all the other services in the ecosystem vai steem connect. Onboarding directly on to Steem does cost but it appears the Partiko dapp makes this steem platform more accessible by providing users with a way to earn their way onto the platform. Downloaded and install the app on your device. Create an account by tapping the ‘person icon’ on the top right side of your screen. Either log-in with an existing Steem account if you have one or create a new account. Enter a unique username and an email address. After you’ve opened Partiko you will see trending posts on the Steem blockchain. You can view other people’s content without creating an account, though you cannot leave comments until you create an account. My experience using these two dapps for the past month is that on boarding to these networks has been made super super simple, a long lasting problem that appears to be dealt with by these two dapps making it easy to onboard via free account incentives, how and if this will be the model going forward for other dapps remains to be seen. The user interface stinks of familiarity and will be easy for any user familiar with current social networks mobile apps, the major thing new users to the space will have to learn is that every action on the platform costs something, and every action has a potential to pay out something. What can be confusing is which digital currency you’re paying in and what that’s actually worth in the real world. Partiko for example, as you will notice on your profile page when you sign up has STEEM, STEEM POWER, STEEM DOLLAR and Partiko Points to manage, this will almost certainly strike people as somewhat disorientating. MurMur on the other hand has just the one currency to keep track of, MUR. However with each and every action written to the EOS blockchain although it is done rather fast it will likely take new users unfamiliar with blockchain some time to realise the purpose of this, it will be interesting to see if users even value such actions, especially if its costing them their precious EOS. Being centralized is about a handful of people having control over the network, either by controlling the technical side of it via block producers or mining pools or the financial side, who gets paid and who has a stake in the network. As a new user you will quickly notice there is not currently any way to participate in the governance of these dapps, this implies some centralised aspects of the services which tend to go against the blockchain ethos. Indeed it was recently revealed Steemit Inc, the mother company and creator of the Steem blockchain Graphene, applied censorship to a Steem article related to classified 9/11 documents, putting Steem, and so Partiko squarely back in the realm of a centralised application. Unfortunately the narrative of decentralisation doesn’t get much better for EOS, with a similar set up as Steem, EOS runs on only 21 nodes that check and validate new transactions. Every 126 blocks 21 new nodes get elected by the stakeholders, these nodes much like the small group of owners and decision makers at Facebook make all the decisions and of course collect most of the value created by the network. Thanks for reading, hope you learned something new, feel free to reach out any time. Disclaimer: information provided in this article does not constitute as investment advice, financial advice, trading advice, or any other sort of advice, and you should not treat any of the website’s content as such. Do conduct your own due diligence and always do your own research before investing.